Our own 1930s home needed an extension to give our family more space on the ground floor, and a new bedroom on the first. We also refurbished the whole home, including a new electrical system and plumbing. 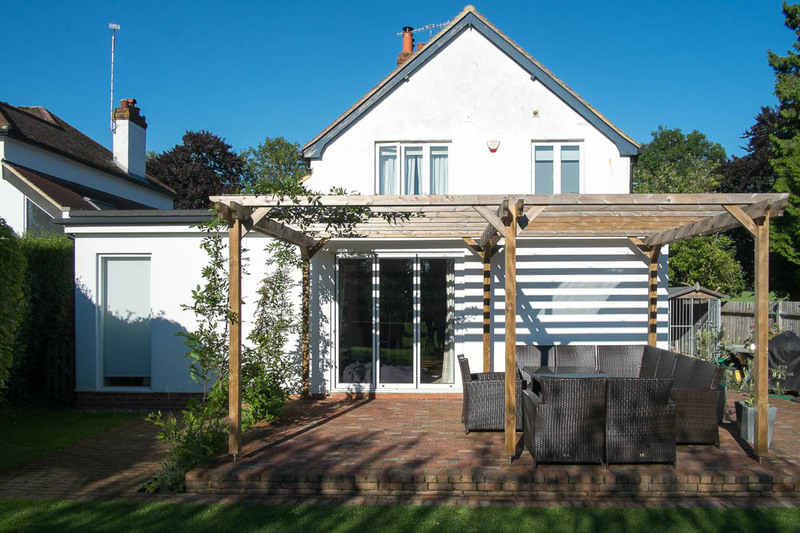 Our extension covers the entire rear of the house, including the garage, to maximise the breadth of space and accommodate a new shower room. The size of the extension takes advantage exactly of the Permitted Development rights. On the first floor, above the garage, we designed a new, timber-frame bedroom. Thanks to simple folding doors, an end window, and an automatic rooflight, the extension has balanced daylight all year round. We also added an external pagoda with climbing plants, that will offer welcome shade in the summer yet do not obstruct winter daylight.